Serif has updated their Affinity Photo image editing app with a number of new features. 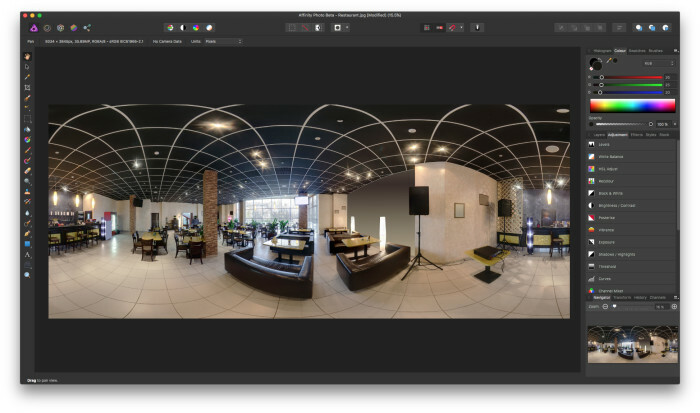 Version 1.5 will be available in early fall with improved HDR merge, tone mapping and new ways to edit 360-degree images, which are growing in popularity. The company is also developing a Windows version which is currently in a free public beta. For more details check out the full press release below. Affinity Photo, the award-winning professional image editing app, is to get a host of powerful new features in its next update. Developer Serif has published a ‘sneak peek’ video detailing what’s new in Affinity Photo v1.5, projected to be available in the Mac App Store in early autumn. The new features will also be included in the hotly-anticipated Windows version of the software, tipped to be in free public beta around the same time. Affinity Photo 1.5 sneak peek from MacAffinity on Vimeo. Revealing the added functions, Serif Managing Director Ashley Hewson notes: “This will be the fifth major update we’ve pushed out since the launch of Affinity Photo – all free of charge to people who’ve bought the app. Chosen as Apple’s ‘App of the Year’ 2015, and ‘Best Imaging Software’ 2016 by the Technical Image Press Association, Affinity Photo’s live retouch tools work in real time and its speed means there’s no waiting to see your results. Non-destructive editing, raw processing and end-to-end colour management are standard, so Affinity Photo has all the accuracy and quality necessary to make beautiful images spring to life. Affinity Photo is available at a 20% discount price of £29.99 / $39.99 / €39.99 until Thursday, July 21, as part of a promotion to mark its first anniversary, before reverting to £39.99 / $49.99 / €49.99. That’s the only price customers pay – there’s no subscription – and the v1.5 update will be free to existing customers. Windows users can register now to take part in the free public beta at affinity.serif.com/windows.